Going skydiving for the first time?! What an exciting moment! I’m sure there’s a rush simply making the decision to go, much like us when we decided to make our first skydive. So we’re here with first time skydiving tips to help you along the way! 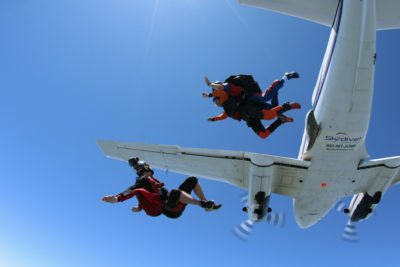 For your first skydive, we highly recommend making a reservation. This helps us plan the day by making sure we can schedule enough instructors, videographers, packers, and pilots to help make our day run as smoothly as possible. GPS directions the day before you drive out. Then add in some time to park, use the restroom and check-in. There’s no need to arrive at check-in earlier than the scheduled time, but arriving just 20 minutes earlier will help you ease into the day and find your way to the office to start your adventure making your first tandem skydive! Plan to spend 4-6 hours with us after you arrive. There are many moving pieces that happen in real time in the sport of skydiving, and much of it is unpredictable like weather that can cause delays. There is a food concession on site and a few games that can help keep you fed and entertained as you wait! Don’t make other plans after your jump as we cannot predict the exact time you’ll complete your day. Not making plans will alleviate much stress! Ok, this may sound like a marketing pitch but trust us, we hear this ALL THE TIME! Many first time tandem skydivers say, “I regret not getting the video!” It’s SO true! 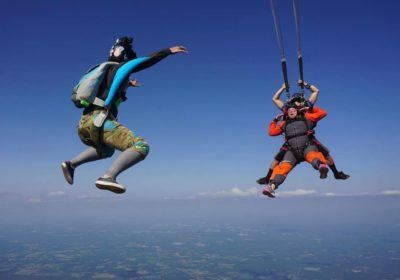 You only make your first tandem skydive ONCE! And for most, it’s a once-in-a-lifetime experience. Being able to relive it with friends, family, and colleagues is incredibly priceless! Gals and gents with long hair will want to tie their hair back. Buns, ponytails, and braids are the way to go! Then make sure to bring a brush because whether or not you wear your hair up, the rush of 120mph will bring a new style to your locks! Wear bright colors, but not too bright! Purples, reds, oranges, and pinks really pop against the blue sky. You can also don one of our jumpsuits to look pro or add a layer to keep you warm. Smile and pose! Smiling is the best and most flattering photo – plus it’s so much fun you can’t help but smile! Tandem skydiving tip: dress for the weather (when it’s cold, layer up; when it’s warm, layer down), wear closed toe shoes that won’t slip off (sneakers are good but old school army boots are too much), and bring a hair tie! And in case you skipped it, read tandem skydiving tip #3! The body needs energy and hydration as adrenaline will be pumping through your body. Drink plenty of water or fluids with electrolytes as well as eat a light meal about 20 minutes before your jump. Great snacks before jumping are nuts, protein bars or toast with avocado (or if you like it sweet, then jam). Pro Tip: if you know that you are prone to motion sickness, be sure to pack a few ginger chews! There is nothing in our day-to-day lives that compare to the exciting act of jumping from a plane. Although you may have dreamt of flying, the actual act of doing it can send your mind in circles and make your heart do flips! In short, it’s normal to feel nervous! We’re here to guide you on this exciting journey of your first tandem skydive. The most helpful part in prep of this adventure is to take a controlled, deep breath every time you start to feel the butterflies. Your instructors will also tell you to do the same thing on the day of your jump, so why not get a head start and get some practice?! Another pro tip to help you prepare mentally is in this day and age it’s easy to want to Google everything, but everything you read or watch on Google doesn’t necessarily apply to you. Every skydiving center, every instructor, every student, creates so many variables that will be a completely unique experience to YOU. So do yourself a favor, there is no need to study or go down the Google rabbit hole. We will welcome you to our little world and train you on everything you need to know on your jump. The best thing you can do is a) have the willingness to jump from a plane, and 2) breathe, and let us guide you on this amazing experience! We’re excited that you’re ready to conquer your first tandem skydive, and we’re here to welcome you into this exciting world! If you’d like to discover more about Skydive Carolina click HERE. If you’re ready to book, click HERE.